Health and Safety is under attack like never before. We are thinking about holding a one day conference in March/April 2013 and would be grateful if you could complete this short questionnaire so we can get an idea of how much support there would be for this. You can suggest topics: eg safety and migrant workers, blacklisting, Lofstedt, HSE cuts, diesel fume, transport issues, contracting out etc And suggest possible speakers. This would be a London Conference organised as part of our London Council contract – so there must be clear London angles. Please respond. It takes about 5 minutes! 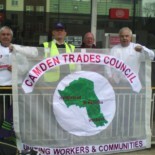 This entry was posted on December 3, 2012 by CAMDEN TRADES COUNCIL.